Saturday afternoons are a beautiful thing, aren't they? This will probably be my last calm, relaxing weekend before I head off to post next month. As such, I've decided to take it easy, think about things, catch up on reading, reconnect with old friends, and, of course, do laundry. I've been a subscriber to TIME magazine for somewhere close to a year now. When I was in college, I was usually able to work through the weekly issues quickly enough that I had finished one by the time the next one arrived. Since I've arrived in The District, though, the issues seem to be piling up faster than I can finish them. So today, I decided to read an issue from two weeks ago that captured my attention as soon as I saw the cover. *At this point, I should probably direct you to the disclaimer found at the bottom of my blog. I'll admit that, before reading this article, I had known some general information about Aung San Suu Kyi and her peaceful resistance efforts against the Burmese government. I knew she had been imprisoned a few times, and that she spent quite a few years under house arrest. I knew she had been released from said house arrest in November of last year. And I knew that she almost always has flowers in her hair. 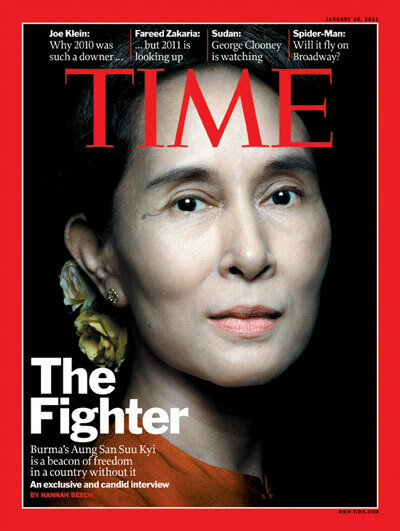 But after reading this cover story, I am much more interested in what she's trying to do for the people of Burma. For far too long, an estimated 56 million Burmese people have been living in poverty conditions that they did not bring upon themselves. Their government is entirely driven by a bunch of fat cat military generals whose sole purpose appears to be to keep the people oppressed and impoverished so they can continue to squander the nation's meager wealth. This makes me sick, really. I'll admit: I don't know what percentage of our national budget is spent on the military versus health and education, but I'd venture a guess to say we have a much better ratio than the Burmese do. I really dislike it when one group of people oppresses another group of people for their own personal benefit, especially when the group being oppressed has little means of fighting back. And that, to me, is where Suu Kyi comes in. Can you imagine that? Can you imagine all of the things you would have missed if you had been under house arrest, especially in a country like Burma? The article mentions the first time she ever used a cellphone was on the day of her release, November 13, 2010. While that's entirely perplexing on its own, it causes me to think about all of the other technological, societal, and even worldwide advances and occurrences in the last 15 years. There have been major, catastrophically destructive natural disasters. There have been technological developments that are almost innumerable, including shrinking a computer from its former gargantuan sizes to the current 9in. iPad. There have been major milestones like wars, peace accords, the death of Mother Teresa and the election of the first black United States President. It's all truly mind-blowing, really. But it also makes me wonder about what must have been a beautiful simplicity in her life. Other than the stress of being confined for so long, I can't imagine that she would have lived a very stressful life there at home. No societal pressures to wear the right clothes, drive the right car, or make enough money. I kind of wish my life had that kind of simplicity in it. Don't get me wrong - I love my life thus far. But I really need to create more opportunities for rest, breathing, and enjoying that life to the fullest. And I suppose maybe that's what I'm doing with this beautiful Saturday afternoon of reflection and relaxation. Here's hoping that, one day, she will accomplish her life's mission. It makes me contemplate my own life and ask myself, what is my life's mission? What is my driving passion, that one thing that I would be willing to sit in house arrest for years with only a radio, books, and limited human contact? What about you? What's your passion...and what are you doing about it? As a completely random post-script, the following music was deeply enjoyed as I wrote this entry: The Civil Wars, Mumford & Sons, and Mandi Mapes.